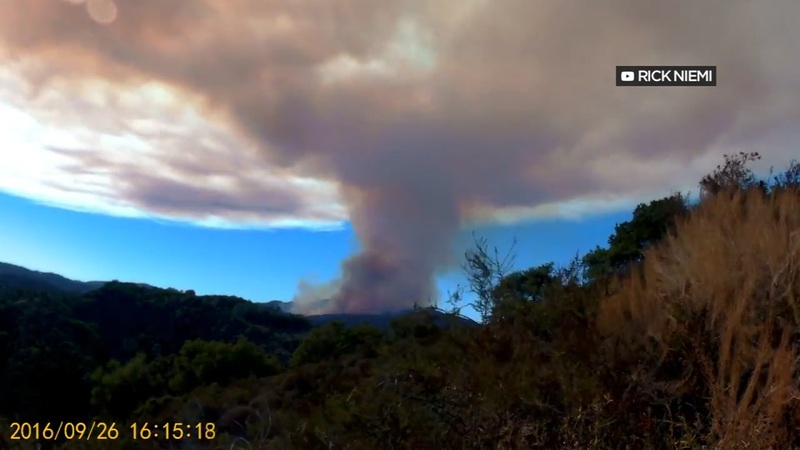 MORGAN HILL, Calif. -- CAL FIRE crews are continuing to gain the upper hand on the Loma Fire that has burned nearly 4,500 acres in the Santa Cruz Mountains. Officials said it is now 94 percent contained. All evacuation orders and road closures have been lifted in Santa Clara County. On Monday, people who live along Summit Road were allowed back into their homes now that the evacuation order for the stretch along Highway 152 has been lifted. Residents, however, are required to show ID to prove they live there. The fire has destroyed 12 homes and 16 outbuildings, damaged one other residence and is threatening 51 other structures, Cal Fire officials said. There were 986 firefighters as of this morning assigned to the blaze, according to Cal Fire. About five firefighters have been hospitalized for minor injuries, treated and released, according to Martin. Food, goods and other donations for those affected by the fire can be sent to the Salvation Army in Santa Cruz and Gilroy and Second Harvest Food Bank in Watsonville. State law doesn't allow Cal Fire crews to solicit or accept donations, agency officials said. The American Red Cross doesn't have enough space at its facilities for donations, but money donations can be made online. Click here if you'd like to make a donation.